A computer screen shows some of the tricky spelling rules that Ann Lawyer, a teacher at Cradle to Career Literacy Center in Emporia, shared with one of her students during a recent online lesson. 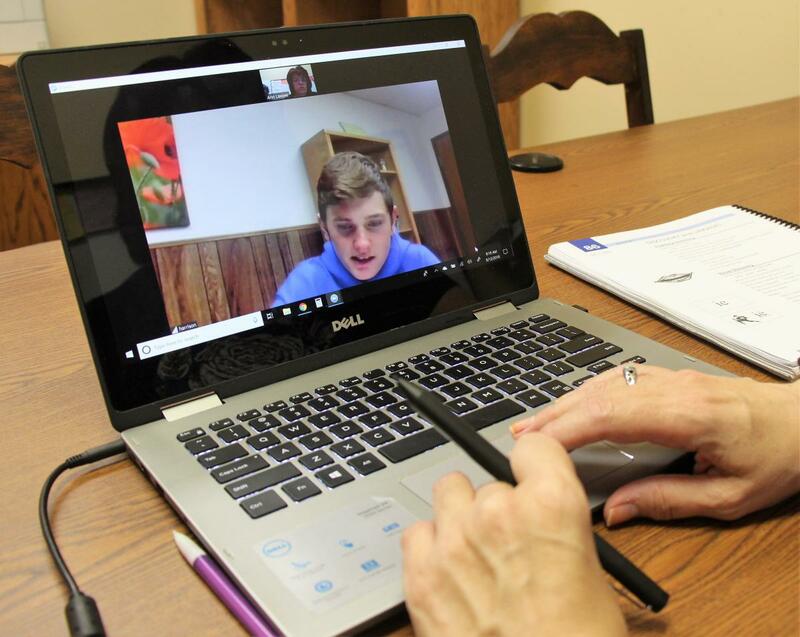 On a recent Wednesday, one of her instructors fired up a laptop for a lesson with Harrison Leniton, an eighth-grader in the southeast Kansas school district of West Elk. West Elk eighth-grader Harrison Leniton reviews advanced phonics rules with his teacher, Ann Lawyer. For years, dozens of parents of children with dyslexia have gone to the Kansas Legislature with stories of students who don’t get what they need in school — or get it years late, when catching up is many times harder. Many want the type of lessons Harrison receives. Now, a state task force could make that happen — with potential, and controversial, effects for how schools teach all children to read. Skeptics of that structured literacy approach watch uneasily. The state’s colleges of education — where proponents of a different kind of instruction dominate — barely show up on the roster for the task force that could determine the next generation of reading instruction in the state. Ken Weaver, dean of the Teacher’s College at Emporia State University, says literacy professors were left out by design. The structured literacy classes that Harrison takes can feel like “i before e except after c” for grad students. Harrison spent the past year catching up multiple grade levels in reading. To do that, he memorized many explicit guides to the maddening world of English orthography. His lessons are peppered with advanced phonics terms. Digraph. Diphthong. Dieresis. “We take them back to the beginning and say, what we need is to show you a different way to learn to read and spell,” Schreiber said. Emporia-based teacher Ann Lawyer counts as her student, Harrison Leniton, parses out individual phonemes, or sounds, in a list of words. Many children fret when they fall behind their classmates, even though studies show students with dyslexia are as smart as their peers without it. When schools don’t offer structured literacy, its proponents say, reading drifts farther and farther out of reach. Children with dyslexia pay the price in anxiety, depression and higher dropout rates. In the past six years alone, American Public Mediasays, more than 30 states have passed laws meant to address concerns that children with dyslexia don’t get help, or even diagnosed. Some of those laws require teachers colleges to teach structured literacy or the basics of dyslexia. Others make schools screen for the disability and offer intensive phonics. Still others mandate annual dyslexia training for educators. Kansas doesn’t have any such state law or regulation — yet. A staggering number of students in the U.S. struggle with reading, whether they’ve been diagnosed with dyslexia or not. In Kansas, more than half aren’t likely to be able to handle college-level complexity by the time they finish high school. More than a quarter are so far behind they’re not even reading at grade level. Poor academic outcomes often get attributed to demographic factors, such as poverty. But dyslexia researchers argue the disability — and the way it often goes untreated — likely contributes to a large chunk of the problem. “The nation has to recognize this is one of the major things holding back millions of children,” said Sally Shaywitz, a professor of pediatrics at Yale University. The co-founder of the Yale Center for Dyslexia and Creativity, she says one in five people has dyslexia. That translates to a handful of children in any given classroom — a strong argument for training teachers and screening students. But other sources peg the prevalence of dyslexia at possibly fewer than one in 20. Those figures have some educators concerned that a national movement of vocal parents is pushing schools to overdiagnose children, or focus too much on what is just one of a wide range of student issues that teachers juggle, from childhood trauma to autism. Then there’s the second big rift that makes conversations between parents and schools difficult: The fight over how children best learn to read. Literacy specialists at colleges of education today largely push balanced literacy, an approach that relies more on learning through context and deduction, less on detailed lessons in sounds and orthography. Dyslexia advocates say decades of well-settled research shows that being more explicit benefits all children, not just those with dyslexia. They say it could mitigate the nation’s literacy problems. Annie Opat, a literacy expert at Emporia State, said she attended some of the teacher training that structured literacy advocates favor. She wasn’t impressed. Rather, Opat worries that drilling students takes away the enjoyment and context that stimulate learning. Instead, Opat said, children need to see significance in what they learn. That view rankles parents of children with dyslexia, who say context and interest aren’t enough to flip a switch in a brain that’s wired differently. The rules that some teachers dismiss as arcane and tedious can be the difference between whether or not a kid will ever make it through Seuss or Salinger. Lori McMillan, a Topeka mother whose 8-year-old, Wyatt, has dyslexia, worried when he continued to struggle with basic words in first grade. She recalls writing “the” on a cue card and studying it with him at home. “By the end of about 20 minutes, you know, he was picking it out of paragraphs,” she said. But 20 minutes later, after practicing the next word, “is,” McMillan showed Wyatt “the” again. What finally worked for Wyatt, McMillan says, was the explicitness of structured literacy. 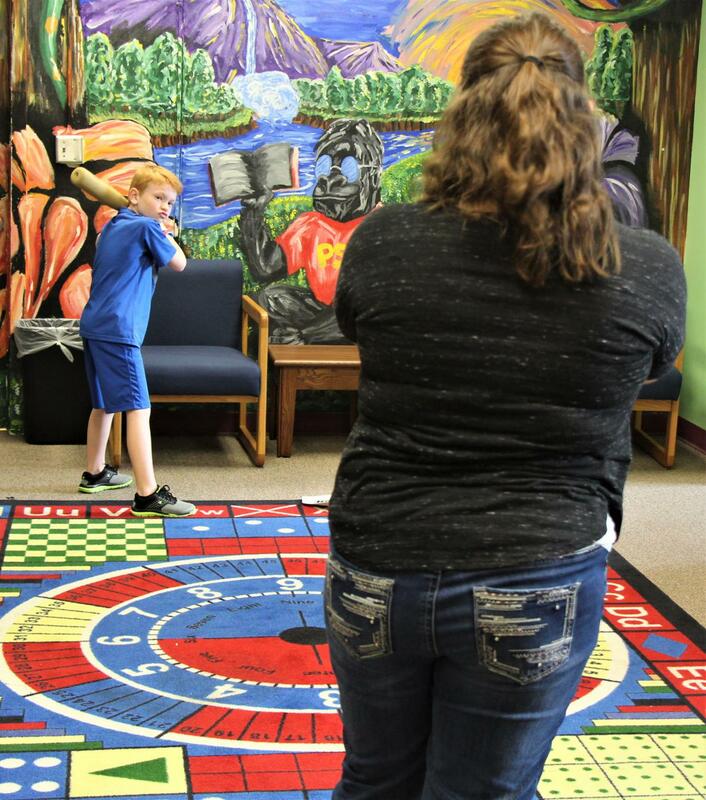 On a recent Monday, a few children learned one-on-one with the staff at Pittsburg State University’s Center for Research, Evaluation and Awareness of Dyslexia in southeast Kansas. The center serves children from multiple states, like 8-year-old Dylan Brooks, of Missouri. “‘King’ without ‘kuh,’” Courtney Hensler prompted Dylan. “Ing,” he replied. “‘Man’ without ‘mmm’?” she followed up. “An,” came his answer. Structured literacy drills aim to stimulate sound awareness in children with dyslexia. Doing the mental calculation of deleting a word’s first sound requires an awareness that those individual sounds exist, and can be pulled apart that way. Hurford leads his college’s dyslexia center and is the sole professor on Kansas’ new dyslexia task force, created by the Legislature last spring. But academics who teach balanced literacy — the other side of the debate — aren’t convinced their approach is so lacking in the skill sets that Hurford says their colleges should teach. 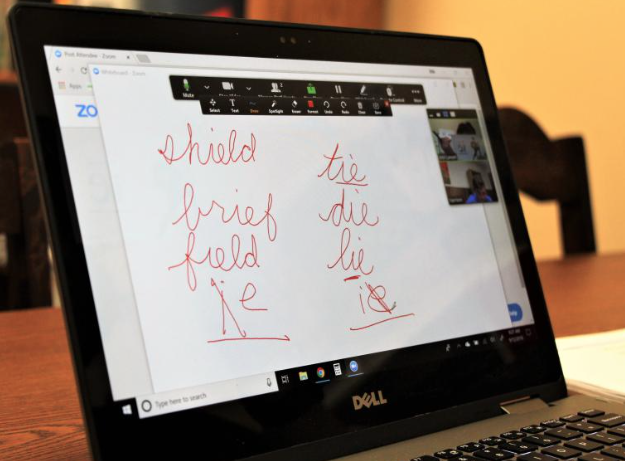 Pitt State’s dyslexia center offers discounts for low-income families, but in other parts of the state, parents say they can’t find such options — if they can find dyslexia specialists at all. Private-practice specialists can cost hundreds of dollars a month. The state’s dyslexia task force wants to address the lack of access through schools. Some of the ideas they’re exploring include making the state’s teachers colleges adjust how they prepare teachers, asking schools to incorporate structured literacy — or parts of it — into reading instruction for all children, and training teachers yearly on dyslexia. Dylan Brooks and his teacher, Courtney Hensler, take short breaks for fun during his after-school reading lessons. Here Dylan aims to hit a ball with a foam bat. The panel will make recommendations to the Kansas State Board of Education, governor and Legislature in January. The 10-member, elected state board could likely have the final say. State board chairman Jim Porter, who also heads the task force, believes his colleagues there will be eager to act. 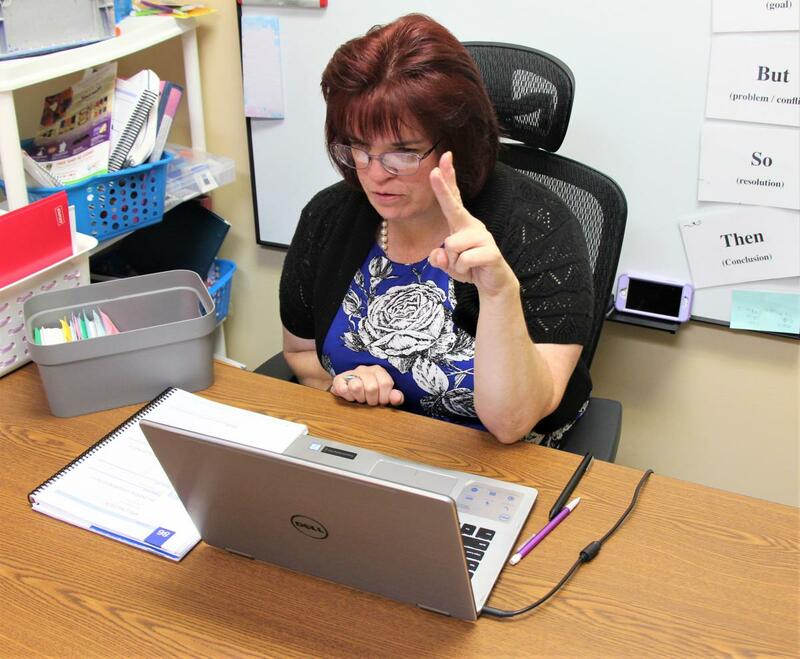 But education groups wary of overregulation — and a proposal last spring to require dyslexia screening — told lawmakers that Kansas teacher colleges already prepare teachers to help struggling readers. Kansas classrooms, meanwhile, should already be monitoring children for academic deficits and giving stragglers extra help. The state’s associations for school boards and special education administrators agreed. But Harrison’s mother, Cynthia Leniton, says structured literacy classes changed her son’s outlook. Now, she says, he sees college as a possibility. “The education system didn’t know what dyslexia really was,” she said, recalling how she moved him to a different school district in search of better help and signed him up for private lessons in structured literacy. When it seemed to work, she showed his new superintendent the results and found him willing to offer the remote lessons at school. The remote lessons cost about $2,500 per student per year. West Elk is now spending about $11,000 for three of its teachers to learn the technique. The task force exploring whether to roll out dyslexia or structured literacy training on a broader scale hopes to calculate statewide cost estimates for doing so by January. That could mean training not for three teachers, but for thousands.